Belize City, Belize (Ms. RAINE INC.): The 'King of the Dancehall' became 'King of Belize' this past weekend when he inaugurated the Belize Reggae Fest Series in Belize City. Scores of Belizeans stormed the Belize City Center to see his Royal Highness Beenie Man, alongside Reggae crooner Anthony Cruz, Dancehall's 'First Lady' D'Angel, dancer Dyema, and DJ Andrew D of Irie Jam Radio. The 'Doctor' Beenie Man sent Belizean Reggae fans into frenzy when he made a surprise appearance at the Santiago Castillo Plaza hours before the big event. Mobbed by throngs of eager fans Beenie eventually had to be whisked away for his own well being. 'Attitude Gyal' Dyema also made a big splash at that Plaza, as Belizean Dancehall fans were equally excited to finally see the 'Dutty Fridaze' dancer live. "I have every Dutty Fridaze and Passa Passa video," states 17 year-old Belizean native Karen. "My mom won't let me go to the show tonight so I had to come down here and see Dyema and Beenie Man. I can't believe it," she says, moved to tears as Beenie Man shakes her hand." "One little girl, she look like she was maybe like 10 years old, she came up to me and pointed at another little girl and said 'my friend here she loves you,'" states a tickled Beenie Man. "So I laughed. But she said, 'No Beenie, you don't understand, she really loves you. She is going to marry you and be your wife and have your kids when she gets big.'" Later that afternoon, fans, armed with cameras, and posters came to the City Center to take in the rehearsal and sound check. Backed by the Ruff Kut Band, Beenie, Cruz, Andrew D, D'Angel and Dyema gave eager fans a taste of what they had in store for this evening. "We have to work tonight," states Angela Martin with her friend Kema in tow. "So we wanted to get over here early to see Beenie Man and D'Angel practice and to get them to sign our posters and take pictures, before we go." "I might have to sneak away from work for an hour or so," says Kema in a whisper. "I've never seen Beenie Man perform before, and I don't want to miss him." Belize Reggae Fest promoters Tasz Smith of Triple T Productions and Garth "Fatman" Guthie of Nuffmuzik Productions, created the series because of the high demand for, but little access to top-level Caribbean entertainment in Belize. 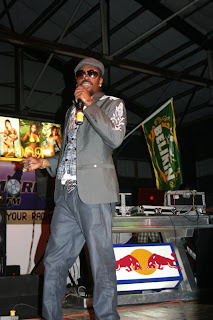 For the springboard event, Smith specifically chose Beenie Man because of his magnetic stage persona. "For the kick-off event, we wanted to showcase the best of that Reggae has to offer, and Beenie Man is one of the best entertainers" states Tasz Smith. "We have a mixture of Dancehall and Reggae; dancing, singing, and deejaying; and male and female talent." Anthony Cruz cooled down the pace with his silky-sweet Lover's Rock singles like "For the Love of You," "Mama's Blessings", and his latest ladies' anthem "Woman 24 7" which drove the ladies mad. One particular female audience member that wanted to get close to Cruz but was too shy to get up on stage, got a surprise challenge from Dyema who stormed the stage and showed her exactly how to handle him, earning both Dyema and Cruz and a big forward. Cruz also kept the rude bwoys skanking with tunes like "Too Bloody," "No Gun A Dance," and his latest hit tune "Dem Block de Road." Dancehall's leading lady D'Angel earned a big forward when she entered the stage with her signature "An Suh." The statuesque sing-jay, clad in a tiny black shorts ensemble, fishnet stockings, and dangerously high-heeled shoes, proceeded to entertain the crowd with a lively mix of her well known tunes like "Blaze," "Baby Daddy," and "Downtown Girl," before empowering independent women, single mothers, and young girls with her latest hit tune "Stronger." Before Andrew D could finish introducing the next act, Beenie Man's "Zagga Zagga Zow" cry came bellowing from backstage to a thunderous response from the crowd. The City Center stage caught fire when Beenie finally appeared, blinged out in a three piece gray suit. Beenie man proceeded to keep the fire burning, giving Belizean fans over two-hours of energetic dancing and stage antics, and high-powered renditions of his lengthy catalogue of hit tunes, infusing Reggae, Dancehall, Hip Hop, and R&B tracks into his performance. 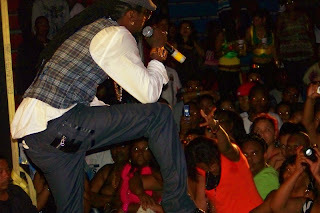 From classics like "Girls Dem Sugar," "Romie" "Blackboard" and "Who Am I" to recent smash singles like "Back It Up" and "Gimme Gimme" he kept going and going and going, until finally, two hours and 15 minutes later, a drenched Beenie Man exited the stage, to the chagrin of his fans who still wanted more. "This is the best night of my life," commented one young fan, clamoring backstage to get a picture of Beenie after his performance. "I didn't think he was ever going to stop, and I wish he didn't," she exclaimed, screaming nervously when Beenie finally emerged from the rest room. Belizean police men escorted the 'Doctor' out of the venue flanked by dozens of fans, mostly young women. Anthony Cruz, also flanked by young Belizean women as he emerged from the venue, stated "the best" when asked what he thought of his fans in Belize. "We have now set precedence," states Garth "Fatman" Guthie of Nuffmuzik Productions. "The next show will be bigger, and the next one even bigger than that. Remember, it is a series that we just established, so everyone will be waiting for the next one." For more information on the Belize Reggae Fest Series, contact Tasz Smith at 917-324-5016 or tasz114@aol.com. You can also find information about the series at www.tripletproduction.com. For media requests for Anthony Cruz, D'Angel, Dyema, or Beenie Man, contact Ms. Raine Inc. at 347-492-3977 or media@msraineinc.com.